Whilst the PSP (Playstation Portable) sold well in its native Japan, it never performed as well as it should have done elsewhere, despite the fact it had a fantastic line-up of games from some of the most acclaimed franchises in all of gaming as well its own fair share of originals. Of all the games that got tragically overlooked due to the consoles relative unpopularity though, Metal Gear Solid: Peace Walker is the one that deserves to be remembered most. Not only is it perhaps still the greatest handheld video game of all time (though the recent new Zelda game on the 3DS came pretty damn close) but it’s almost certainly one of the best Metal Gear games available on any platform. Thankfully, gamers who passed over the PSP were given the chance to play the game again on the Metal Gear Solid HD bundle, but 3 years had been and gone by then and the dust had already settled. So here we hope to shed a little light on what should be remembered as not only a great achievement in portable gaming, but a great achievement full-stop. The Metal Gear Solid franchise is unique amongst video games. From its humble beginnings on the NES in the late 80’s, up to the industry changing marvel of the first Metal Gear Solid for the original Playstation a decade later and finally up to the final chapter on PS3 in 2008, the franchise has evolved dramatically in parallel with the industry it helped to build. Hideo Kojima’s genius was (in my eyes, but understandably not in everyone else’s) fully realised with Metal Gear Solid 4, a game (nay experience) which I personally held beyond compare until ‘The Last Of Us’ wiped the slate clean earlier this year. The term ‘interactive movie’ had been bandied around by industry pundits ever since the days of Dragon’s Lair but in MGS4 the potential of video games as a serious art-form finally came into full focus. Kojima managed to pull off an experience which combined the depth and emotional clarity of a novel with the gloss and sparkle of a major Hollywood blockbuster whilst also delivering on immensely playable, deeply satisfying gameplay. The convoluted nature of the plot and the hours upon hours of cut-scenes were not to everyone’s tastes but to those who ‘got’ it, MGS4 was a masterpiece. So how could a dinky little portable spin-off game possibly compare? Well for one thing unlike it’s predecessor (2007’s ‘Portable Op’s) the game was built from the ground up by Kojima, add to this the fact that it was once being peddled as MGS5 and expectations were understandably reaching fever pitch amongst fans leading up to the games release. So does it topple MGS4 as the ultimate Metal Gear experience? No, not at-all, not by a long shot, but as a portable gaming experience it remains frankly peerless and unless Kojima decides to try his hand at a PS Vita or Nintendo 3DS Metal Gear in the coming years, I can’t see that changing any time soon. The plot is a direct continuation of the classic Playstation 2 title ‘ Metal Gear Solid 3: Snake Eater’ which followed the modern day Solid Snakes predecessor (well clone daddy anyway) en route to earning the fabled title of ‘Big Boss’. 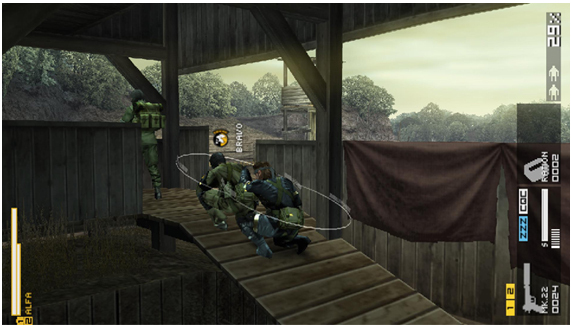 Peace Walker picks up the story 10 years after MGS3 in 1974 at the tail end of the cold war. Snake has abandoned the country who betrayed and used him and has set up his own nationless army in central America (series veterans will clock this as a precursor to Big Boss’s outer haven). At the on-set of the game the KGB recruit Snake’s army to distil mounting tensions in Costa Rica as they speculate the CIA are preparing for nuclear warfare. Of course nothing is as simple as it seems and the story unfolds in typically daft and imaginative Kojima style. Gaps in the history of the series are filled in a manner which will please the faithful and the moving comic book style utilised in the cut scenes is gorgeous and involving (at certain points you’ll even be taking control of the scenes yourself). 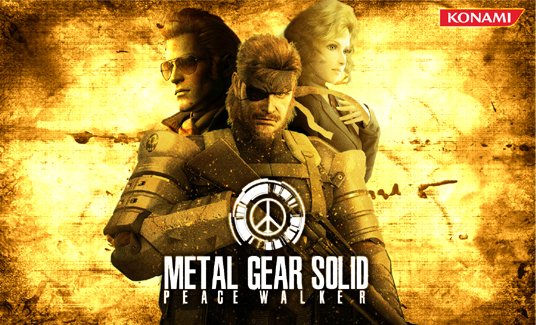 Gameplay wise Peace Walker takes the best elements from its portable predecessor and MGS4 and combines them into one of the most balanced and rewarding Metal Gear experiences. Controls are tight and intuitive with the camera refined to perfection (though the lack of a second analogue stick will irk those who have become accustomed to the Vita) and the vast selection of weapons and gadgets are easy, accessible and simple to use. The camouflage mechanic which was perhaps a little too in depth in MGS3 and 4 is here just a subtle addition to the gameplay and switching from third-person to over the shoulder to take down an enemy works exactly as it should. Away from the battlefield ‘Mother Base’ mode allows you to manage your army almost as you would in a football management sim via an easy to use and attractive menu. It’s an idea which is taken JUST far enough without interfering with the main game and adds a neat RPG element to the experience. The conceit through which you recruit new allies might be a little hard to swallow (you knock out enemies in the field then attach them to a balloon which zips off into a waiting helicopter where they are instantly converted to your cause) but I’ll let it off the hook purely because it works so well (unlike the laborious process in portable ops where you were tasked with dragging unconscious enemies at a snail’s pace back to a waiting van). Stealth is a more valuable asset here than ever before, whereas in earlier games you could get spotted, find a locker and wait it out until your pursuers lost interest, in Peace Walker the enemies are relentless so it really is in your best interest to remain undetected. Of course the enemies unrelenting nature can have its drawbacks. For example there is a co-op mode which allows you to undertake missions with a friend over wifi, this works well but some missions (the later ones especially) have obviously been designed with co-op play primarily in mind so are almost too difficult when playing through solo. Also while we’re onto drawbacks the cut-scenes too can be a little cloying, in MGS4 it could be forgiven considering the gorgeous production values but as pretty as the comic strip scenes are there are a few too many of them for comfort. I’m just nitpicking here really though as not only is Peace Walker without a doubt the best portable video game ever, it also expands an already involving and epic story into realms previously thought impossible after the sombre conclusion of MGS4. With the stunning looking MGS 5 (due next year) rumoured to be a direct follow-up to Peace Walker, there is no better time than the present to experience this fantastic game. Dust off the PSP or pick up a copy of the ‘Metal Gear Solid HD Collection‘ on the PlayStation Vita, you could even sell your old psp online to make up some of the cost for it and get this game on the PlayStation app store for your Vita. About the author:An MGS fan since the days of the NES, Charles Barley is a freelance copywriter from the UK who is waiting with bated breath for both ‘Ground Zeros’ and ‘The Phantom Pain’ to drop next year!